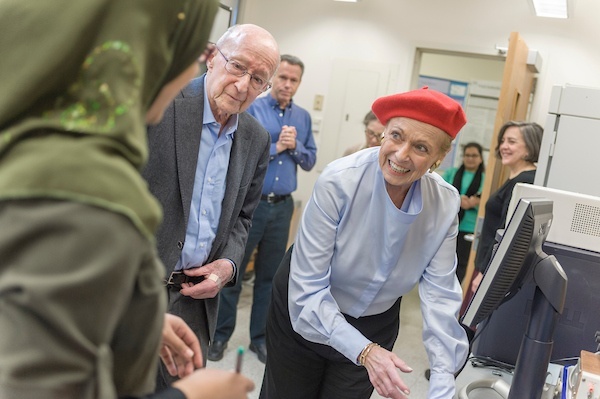 Donors Suzanne and Stanley Arkin met with biology faculty member Drew Cressman and students Nora Nesheiwat and Isabel Bilek on a recent visit to the College. The students, both class of 2018, had been Arkin Externs this past summer. They discussed their experiences doing research at Mt. Sinai Hospital and the New York Botanical Garden respectively, and their intentions to continue in science careers after graduation. Another senior, Hagerah Malik, who works as a research assistant, explained the workings of new equipment made possible by the couple's gift. Two new pieces of equipment—an inverted fluorescent microscope that shows cells, which have been modified by the insertion of new genes, and a quantitative/real time pcr that measures levels of gene expression in cells and quantitates it—have transformed the lab used for molecular and genetic classwork and research.